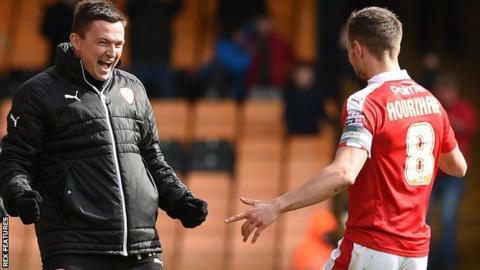 Barnsley warmed up for next weekend's Johnstone's Paint Trophy final at Wembley by maintaining their play-off challenge with victory at Port Vale. Skipper Conor Hourihane scored the only goal with a soft free-kick which was allowed to drift in at the far post. Ajay Leitch-Smith forced a good save from Tykes keeper Adam Davies as Vale pressed for an equaliser. The home side wasted several chances after the break and Barnsley held on for a fourth successive away win. Sam Foley, Richard Duffy, Carl Dickinson and Ben Purkiss were among those guilty of failing to direct efforts on target as Vale saw their own play-off hopes fade. Barnsley remain seventh in the League One table, but below Millwall on goal difference only - with the Lions set to face leaders Burton Albion in Monday's evening kick-off. Vale slipped a place to 11th, and six points outside the top six, with only six games left to play this season. "Great result, great four points from what we knew would be two difficult games under special circumstances. "But we know we can play better than that - we need to play better than that in the remaining seven league games. "It's another clean sheet, which is fantastic, especially away from home - and we keep saying that those clean sheets guarantee you at least a point. "We would have loved to take one of the chances we had on the counter in the second half, then we could have relaxed a little bit and had a different pattern for the last 15-20 minutes." Match ends, Port Vale 0, Barnsley 1. Second Half ends, Port Vale 0, Barnsley 1. Attempt missed. Ben Purkiss (Port Vale) right footed shot from the centre of the box is just a bit too high following a corner. Corner, Port Vale. Conceded by George Williams. Attempt missed. Louis Dodds (Port Vale) right footed shot from the centre of the box is close, but misses to the left. Corner, Port Vale. Conceded by Marc Roberts. Attempt blocked. Sam Foley (Port Vale) right footed shot from the centre of the box is blocked. Sam Foley (Port Vale) wins a free kick on the left wing. Attempt missed. Sam Kelly (Port Vale) left footed shot from long range on the left is close, but misses the top right corner. Attempt missed. Richard Duffy (Port Vale) right footed shot from the centre of the box is close, but misses to the left following a set piece situation. Corner, Port Vale. Conceded by Alfie Mawson. Shaun Tuton (Barnsley) wins a free kick on the left wing. (Port Vale) wins a free kick on the left wing. Foul by Adam Hammill (Barnsley). Attempt missed. Theo Robinson (Port Vale) header from the centre of the box is close, but misses to the left. Substitution, Port Vale. Sam Kelly replaces Ryan Inniss because of an injury. Foul by Ashley Fletcher (Barnsley). Corner, Barnsley. Conceded by Ryan Inniss. Attempt blocked. Shaun Tuton (Barnsley) right footed shot from a difficult angle on the left is blocked. Conor Hourihane (Barnsley) is shown the yellow card. Substitution, Barnsley. Shaun Tuton replaces Ivan Toney. Ashley Fletcher (Barnsley) wins a free kick on the right wing. Attempt missed. Sam Foley (Port Vale) right footed shot from the centre of the box is just a bit too high. Substitution, Port Vale. Theo Robinson replaces JJ Hooper. Substitution, Port Vale. Michael Brown replaces Michael O'Connor. Attempt missed. Michael O'Connor (Port Vale) right footed shot from outside the box is just a bit too high from a direct free kick. Aidan White (Barnsley) is shown the yellow card for a bad foul. Attempt missed. Adam Hammill (Barnsley) right footed shot from the left side of the box is close, but misses to the right. Adam Hammill (Barnsley) wins a free kick on the right wing.